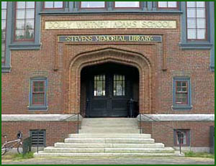 The Stevens Memorial Library in Ashburnham, Massachusetts. The population of the town of Ashburnham is only about 5,500, but it has supported a small library since the 1880s. Public libraries, large and small, can be delightful resources for those who want to take charge of their own learning. Their holdings include materials from fields you know well, and from fields you know nothing about. If you aren't familiar with your town's library, consider beginning to explore it. If you are already familiar with your town's library, are there not some corners you haven't explored? If not, consider exploring the library of a neighboring town. The disorientation caused by unfamiliarity usually leads to educational surprises. Photo courtesy the Stevens Memorial Library. Have you ever seen an airplane-related disaster in an in-flight movie? I doubt you'll see Snakes on a Plane on your next flight to LA. The criteria the airlines use for selecting onboard film entertainment probably eliminate anything that might make passengers uneasy. Relying on others to choose your onboard entertainment restricts your film choices to meet criteria set by others. The airlines' goal is not merely to entertain — they want to entertain without the risk of creating anxiety or fear in some passengers. Even if you personally wouldn't experience anxiety from watching Snakes on a Plane, on a plane, people who don't know you are making the choice for you. And even if they did know you, they would still be concerned about other passengers. As it is with entertainments, so it is with learning. Most of us learn from the stream of knowledge that comes our way by happenstance. Unless you take charge of your own learning, what you learn might be determined by the biases and preferences of others. Here are some examples, with suggestions for taking charge. Broadcasting, film, newspapers, magazines, and books provide most of the curriculum of our own personal learning. Revenue goals certainly influence the content decisions of media organizations, and for most of these outlets, achieving balance in your own personal education is not a goal. But with some effort, you can get balanced, provocative content from mass media. Avoid scandal sheets and exploiters of incendiary or titillating topics, because their primary focus is revenue. Do you seek unusual sources with clear records of achievement? Do your mass media sources regularly set exemplary educational standards? In conversations with people in our immediate social circles, we exchange what we've learned elsewhere, occasionally delivering original thoughts. But few of us actually seek connection with people for their ability to present provocative ideas. your brain in motion?do much about choosing your relatives, but you can choose friends and acquaintances. Do you seek connection with people who can set your brain in motion? When employers and certification organizations consider what they would like you to learn, they tend to emphasize their own near term needs — this year's technologies, or the next couple of years at most. But your career lasts longer than that, and your own need for income and stimulation have a more distant time horizon. When you use employer resources to fund your learning, and when you seek professional certifications, do you set objectives that produce lasting value? Neglecting your long-term goals can produce a storehouse of knowledge with relatively short shelf life. Would you like to see your comments posted here? rbrenIcpBVSbOfDwKJHJOner@ChacVVxeoSpVSUXjYbpKoCanyon.comSend me your comments by email, or by Web form. I offer email and telephone coaching at both corporate and individual rates. Contact Rick for details at rbrenXbOiOfRRNiEtcvODner@ChacmdIcSGtofcrHttwCoCanyon.com or (650) 787-6475, or toll-free in the continental US at (866) 378-5470.